French artist Jean-Baptiste Benard has been called a “little unfamiliar master.” Though next to nothing is known of his life, a handful of extant paintings reveal that he was adept with the fêtes galantes, a category of painting combining landscape and figures in bucolic scenes of romance and leisure. 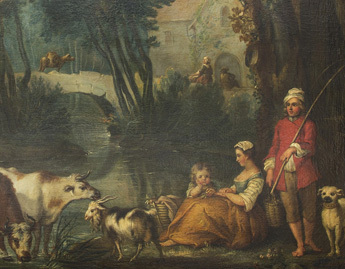 While the overt eroticism typical of the genre is absent here, the lush foliage and docile animals underscore the fecundity of a youthful, blushing couple—already with one cherubic child—in the lower right. Beloved by the court of King Louis XV and especially his famous mistress, Madame du Pompadour, intimate, pleasing pictures like this one represented a departure from the Baroque style and the dominant role of religion in the arts.